In this file photo taken on September 5, 2018; US Supreme Court nominee Brett Kavanaugh speaks on the second day of his confirmation hearing in front of the US Senate in Washington DC. President Donald Trump’s conservative pick for the Supreme Court Brett Kavanaugh denied Friday involvement in an alleged sexual assault on a woman while they were in high school in the 1980s. In a statement released to US media, Kavanaugh rejected the woman’s claim, made in a letter to Democrats vetting his nomination, that he tried to force himself on her during a party while they were in high school. “I categorically and unequivocally deny this allegation. 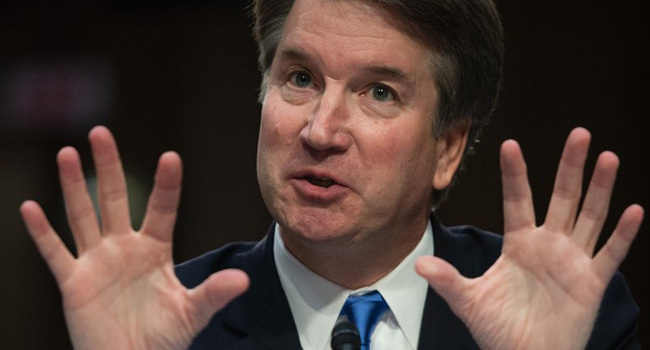 I did not do this back in high school or at any time,” Kavanaugh said in the statement. The allegation came just one week before the Senate Judiciary Committee is to vote on his nomination. If approved by the committee and the whole Senate, as has been expected, Kavanaugh is likely to decidedly tilt the court to conservatives for years to come. Democrats fighting the nomination say that could turn the court away from guaranteed abortion rights, against programs that benefit disadvantaged minorities, and for greater presidential immunity from the law. The information came from an individual who wanted to remain anonymous and had declined to press the issue themselves, Feinstein said. According to an account in the New Yorker, the incident happened while Kavanaugh, now 53, attended the elite Georgetown Preparatory Catholic all-boys high school in suburban Washington. The woman, from a nearby high school, was allegedly at a party where the youths were drinking alcohol. In a room with the woman, Kavanaugh and another male teen turned up the music and placed their hands over her mouth so that no one could hear, and Kavanaugh “attempted to force himself on her,” the New Yorker reported, citing the woman’s account. She struggled with them and escaped, the account said. The woman “said that the memory had been a source of ongoing distress for her, and that she had sought psychological treatment as a result,” the New Yorker said. A group of 65 women signed a letter attesting to his character. “Through the more than 35 years we have known him, Brett has stood out for his friendship, character, and integrity. In particular, he has always treated women with decency and respect. That was true when he was in high school, and it has remained true to this day,” they said.